Zurcom is also the coordinating office for the IBG Global. Global sales and intelligence are critical to commercial entities operating in the world today: our firm is at the forefront of this direction as a practitioner. IBG Global offers key contacts and exclusive information in new global markets. IBG Global carries out high quality agent/distributor, end-buyer searches, research and in-country support specific to your company, industry and target market requirements. 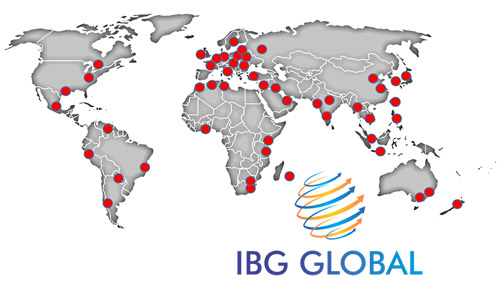 Using the IBG Global network, you get closer to the sales you need in the international business environment. The International Business Group (IBG) is an association of private commercial consulting firms with offices in 21 countries, and staff in another 30. IBG Global covers more than 150 country markets. IBG Global has completed export assistance projects for over 45,000 different companies and represents many corporate, national and sub-national entities engaged in export and investment assistance globally. In terms of practical assistance to companies, IBG Global has a wealth of experience that cannot be matched by other commercial groupings. Our approach is sales driven, based on what works in the global business environment. We offer a range of trade and investment services to clients through our network of international trade and investment consulting offices covering markets in the Americas, Western & Eastern Europe, Asia-Pacific, Africa and the Middle East. The IBG Global client base includes corporate, provincial and state level governments, national governments and multi-governmental organisations. Our past and present clientele includes US state government export and investment entities, national entities such as the governments of Finland and Singapore and sub-national entities not related to American states such as South African provinces or Australian state governments. Many of our members provide corporate representation for outreach into new markets. Our membership is drawn particularly from companies currently active in the market and able to take on new projects using the current global best practices.